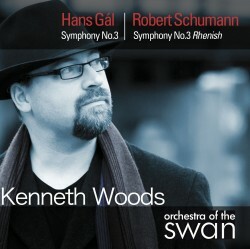 Avie continues to bring to light the music of Hans Gál – “music well worth championing,” according to The Sunday Times (London) – with the world premiere recording of the Third Symphony conducted by committed advocate, American conductor Kenneth Woods with the enterprising Stratford-upon-Avon based Orchestra of the Swan. Written in the post-war years, after the “continental Briton” had settled in Edinburgh, the work ranges from lyrical tranquillity to a densely contrapuntal and rhythmically complex style. Gál’s compositional pedigree is strongly linked to the Austro-German tradition going back to the 18th century Viennese classical masters. The pairing of Schumann’s Third Symphony is appropriate, presenting Gál’s music alongside symphonic repertoire that represents its roots and core values. Woods made headlines with his first recording of Gál’s music on Avie with orchestral and concertante works conducting Northern Sinfonia (AV 2146). Here he conducts Orchestra of the Swan, where he is Principal Guest Conductor, in the first of a projected cycle of all four of Hans Gál’s symphonies.